Stanley has surpassed our expectations for this year – as outlined in work published in January. Today’s Craftsman announcements and strong numbers have pushed SWK’s skepticism index well below zero for the first time since 2003. Investors are finally beginning to give SWK the benefit of the doubt for a strategy that we think has been working well for years. Valuation now discounts improving returns on capital – but not by much, and targets that we believe SWK will break through easily over the next 12 months. 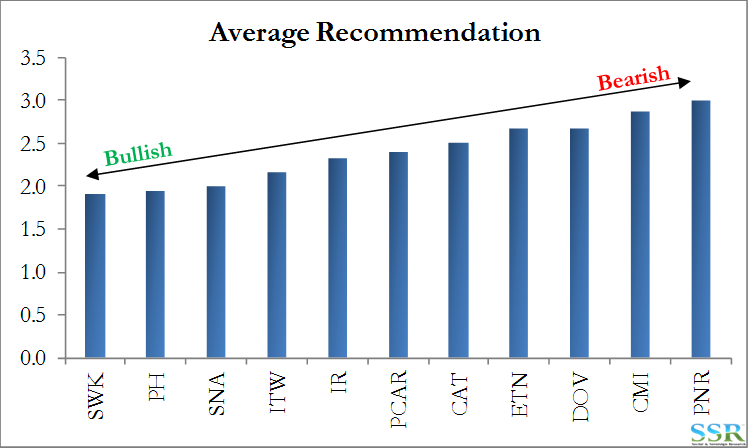 While 2018 consensus has moved up 6.5% since we wrote in January we think that the company will earn more than $9.00 in 2018 – so a further 9-10% upside revision/surprise. We got a sense in early January that the company was much more excited by its Craftsman acquisition than the Newell Brands deal. Clearly that is the case with today’s comments and the press release from Lowe’s. The return on capital dilution from the acquisitions last year is beginning to unwind, but the company still has significant earnings upside from returning to trend – which suggests normal earnings of $9.50 per share based on 10% return on capital. 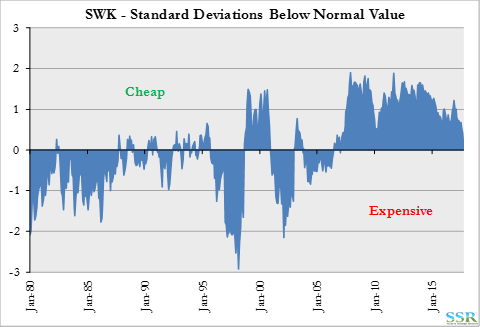 Long term average return on capital – ignoring the negative trend – is 11.6%, which would suggest earnings power of closer to $11.00 per share (we are not suggesting that this is likely and do not need it to make a case to hold on to the stock today). The company has raised full year guidance but we suspect there maybe a little lagniappe in that number – in part because of Texas. 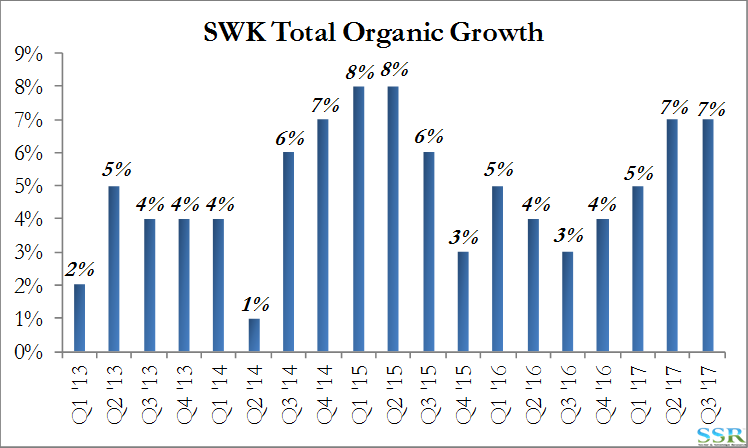 Since 2012, SWK has beaten Q4 estimates by an average of 3.0% – Exhibit 1. One standard deviation above normal is a reasonable target in this market – $200/share. The risk is the love-fest – SWK is now the most loved stock in large-cap Capital Goods – this is generally a sell signal. Overview – Continuing the SSR Industrials and Materials Way – From Reversion To Mean To Skepticism! Stanley Black and Decker (SWK) remains one of the best examples of a stock specific research call driven by our “normal value” framework – both proving the value of the process and driving a good stock recommendation. Our methodology looks for good, historically reliable “reversion to mean” stories that are mispriced because they have deviated from their mean. We picked Stanley three years ago because of its consistent “buy-fix-integrate-improve” strategy, which allowed the company to grow its capital and earnings in what is generally a deflationary business – in other words, the fundamental overlay gave us confidence that the pattern would repeat. The additions to the brands and capital base in late 2016 gave SWK ann opportunity to outperform by sticking to the method and model that has worked for decades. Our methodology initially led us to SWK and, despite a spectacular year to date, gives us confidence that it will continue to outperform. 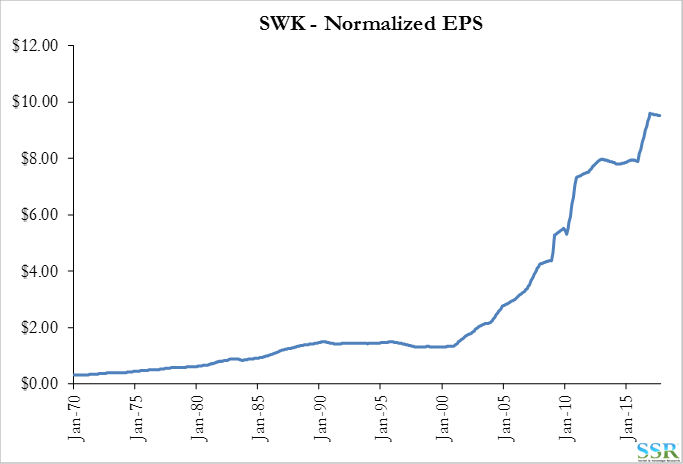 SWK has a very strong history of buying bolt on businesses, growing its capital base, driving synergies and pushing return on capital back towards a trend that implies strong earnings growth and stock performance. With the exception of the foray into security, which in our view was a poorly advised “off-piste” move for the company, SWK has bought businesses that have expanded its core portfolio and then driven synergies and growth from these deals. While the company may have a negative slope to its longer-term return on capital, initially dilutive deals have been fixed, returning the company back to trend – Exhibit 2. Exhibit 2 showed the issue clearly back in January as the sell side was quick to add the capital base to forward numbers but does not attribute the earnings opportunity immediately, and the current return line had a pronounced negative slope in January as forward estimates were too low (the return calculation is based on forward earnings and picks up consensus for the most current 12 months). Consensus estimates have risen through the year – in part because of the positive surprises shown in Exhibit 1, but they are still shy of the trend return on capital, and this is the opportunity. The Craftsman initiative may allow the company to close the gap quickly, and possibly begin to reverse the trend. We expect the company to keep surprising to the upside, raising its dividend and outperforming as a consequence. 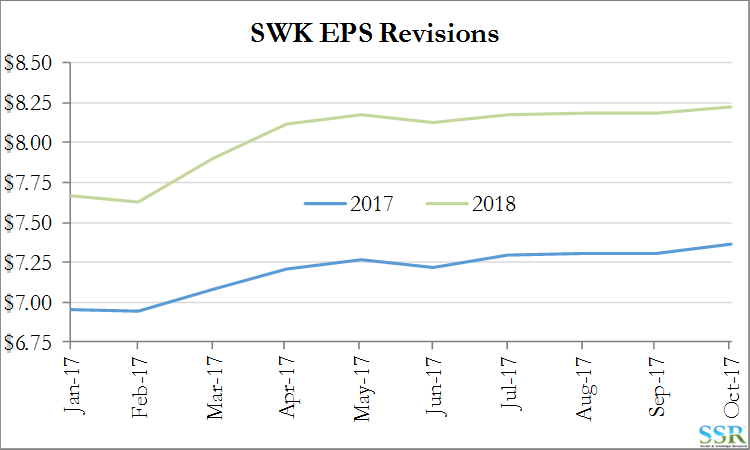 SWK is still under-earning versus history, though driving improvements to those earnings and heading back towards trend (Exhibit 2). 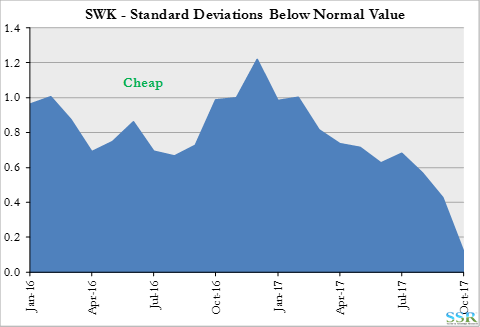 After the performance year to date, the market is now pricing the company based on its normal (trend based) earnings rather than current. The stock is essentially at its normal value today – Exhibit 5. Skepticism work shows growing investor confidence – with the stock now discounting a return to normal earnings – this is the first time the market has shown real confidence in SWK since 2003 – Exhibit 6. Note that the valuation component of the analysis is relative to the S&P 500 and so accounts for the highly valued broader market. Obviously, the time to buy this stock was early 2016, but even at current levels we believe that earnings growth and overall momentum can carry the stock higher. 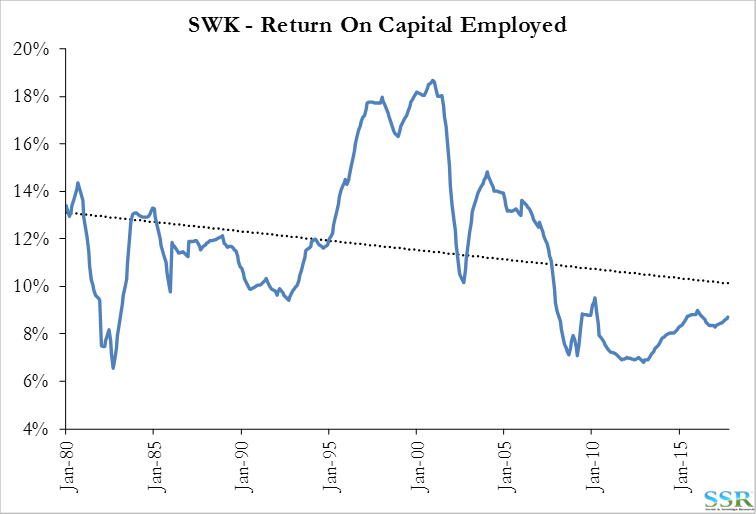 One standard deviation above normal value today would put the stock at $200 per share. 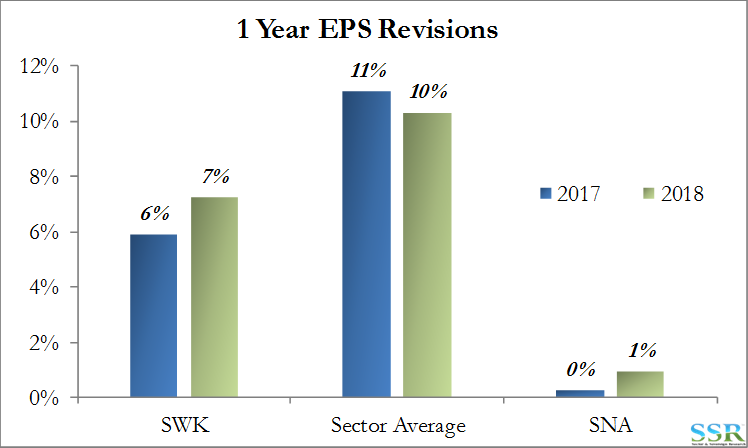 SWK has seen positive earnings surprises in 2017 (Exhibit 1) and revisions have been generally positive (Exhibits 7 and 8). However, in our view, while forward estimates show growth they fail to recognize the opportunity created by the 2016 deals – 2017 may now be off only by one or two percent, but 2018 could still be off by more than 10-15%, as outlined above. None of these statements include any potential benefit from stronger US economic growth driven by potential stimulus policies, or lower tax rates. As shown in Exhibit 9, SWK is now the most loved stock in large cap Capital Goods – which was not the case when we wrote in January. In general, you want to own a stock as the sell side grows more fond of it, but run for the hills once there is a full scale “love-in”! (See research.) We have a “love-in” today! The cautionary value analyst in me would say take the gains – but this is a momentum market and SWK has all the right levers today to keep the momentum going – maybe take half your profits! If growth is peaking in Q3 2017 like it did in 2015 (Exhibit 10) then perhaps the upside from here is limited – if not (driven by the Craftsman initiative and better growth in the US), $200 is a reasonable target.